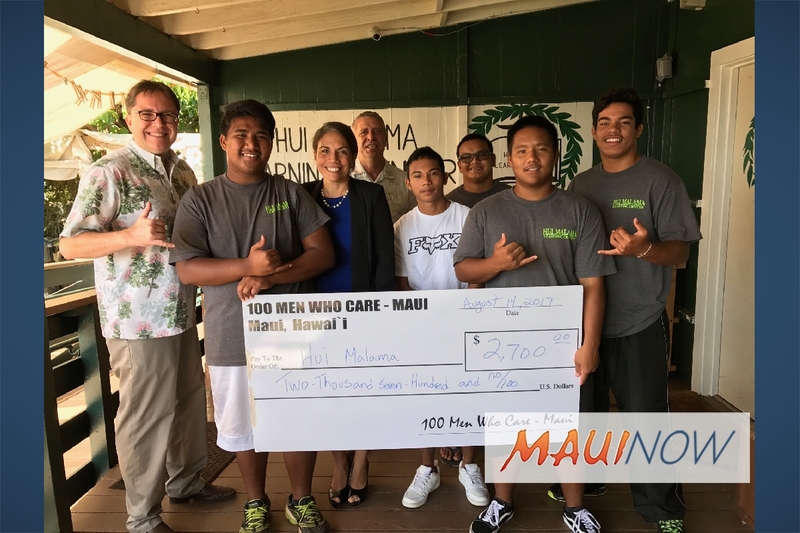 The 100 Men Who Care – Maui Chapter announced it has donated $3,800 to Maui Hui Mālama. The announcement came during the group’s meeting on Aug. 14, 2017. 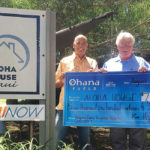 100 Men Who Care donated nearly $4K to Maui Hui Malama. Photo Courtesy 100 Men Who Care..
100 Men Who Care is an association of men committed to making a positive and significant impact by supporting local nonprofits that serve the Maui County community. It is a place where men are able to gather, network, build friendships and help provide financial support to organizations in need. On Aug. 15, 100 Men founder Keith Regan and member Paul Tonnessen presented checks totaling $2,700 to Executive Director Pualani Enos and an additional $1,100 was received since the meeting and has been delivered to Maui Hui Mālama bringing the total contribution to $3,800. 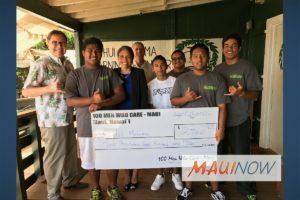 The 100 Men Who Care – Maui Chapter was formed more than two years ago and has donated over $34,000 to local Maui nonprofits since its inception. 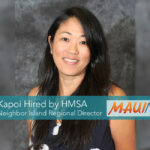 Organizations that have benefited include Friends of the Children’s Justice Center, Maui Search & Rescue, Boy Scouts of America – Maui County Council, Women Helping Women, Habitat for Humanity, Hawaiʻi Society of Professional Engineers – Maui Chapter, and Hale Kau Kau. 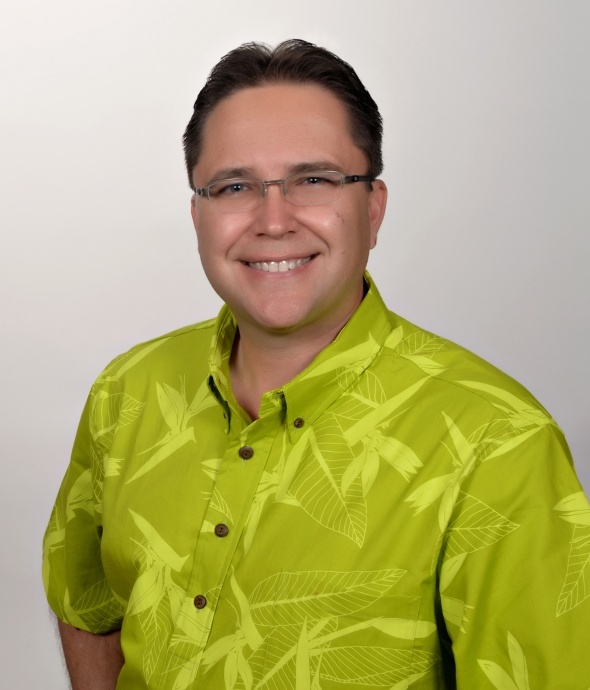 The organization holds a 90-minute meeting four times per year and, through an interactive process, selects one Maui nonprofit to receive member contributions per meeting. 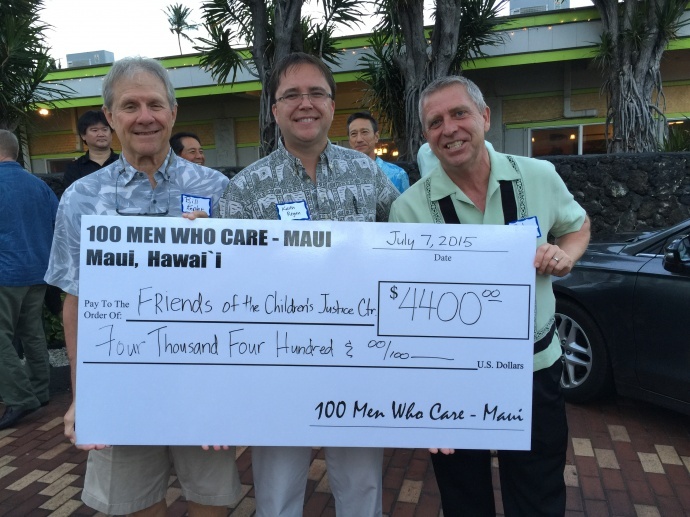 For more information about the 100 Men Who Care – Maui Chapter click here.